We all know there are different strategies you can use, the least-friendly yet most popular being the follow unfollow method (VOMIT). Don’t worry, we aren’t going to be teaching you any slimy tactics today – no siree! 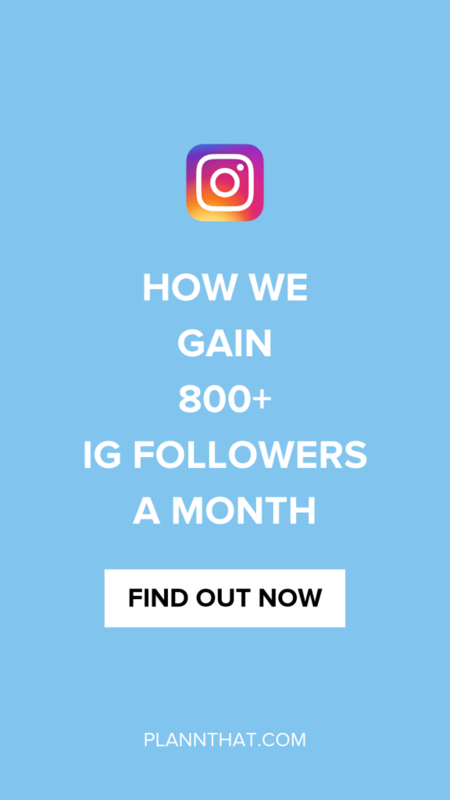 Today we are instead going to take a peek behind the curtain to show you exactly how our Plann IG account has been gaining over 800 new Instagram followers per month, consistently. Keen as anything to get started? I know you are! Before we dive into the strategies and techniques that we are using to gain 800 new Instagram followers per month, here’s where our account sits at the time of writing this case study. Pretty cool right? Something else to note is that since launching our business and the Plann app a couple of years ago, we have (on occasion) taken a break from posting for 1-2+ months at a time. It is the reality of running a startup on your own, really! Only in the last 8 months have we had someone full-time, 100% owning our Instagram strategy from content to engagement and seeking out partnerships and advertising opportunities. So, in knowing our past with this beloved Instagram handle, we can now move forward to the exciting bits – yay! As the years have progressed, the Instagram posting frequency that works the best has changed a lot! In 2018 we started the year posting upwards of 5 times a week to the grid and posting daily to Instagram Stories. Since then we’ve found that the posting frequency that works best for us is 3-4 times a week to the grid paired with daily stories. For the longest time we were posting at around 7pm AEST (yep, we are based in Australia!) but in the past 6 months we experimented with posting at 3pm and 1pm and found that 3pm is our best posting time by a long shot. Even though 3pm is a flipp’n great time for us to post, please keep in mind that experimenting is essential to finding what works for your unique Instagram account. We all have followers from different parts of the world so timezones definitely make a big impact on what posting times work best for you. While we 100% recommend changing up your Instagram hashtags at least once a month, through all of our experimenting we have found that one hashtag grouping in particular reaaally gets our engagement flowing in. The way we found our best performing hashtags? Right inside the Plann app analytics. It’s something that is really uncommon in the world of Instagram, but it just so happens that when we use this one set of hashtags we will generally get above 400+ likes per post compared to using other hashtags that will set us back down to 275-350 likes. Our entire content strategy at Plann revolves around offering up content that is valuable. But what makes our content so juicy? The reason our content is so successful is because anything we post to Instagram has to either be funny or educational. If it isn’t either one of these things, it doesn’t get posted. After testing out what content performs best for us on the ‘gram, we found through our Plann app analytics that content that is hilarious or crazily helpful is our sweet spot for lots of engagement. Use your analytics to find out what content works well for you, and keep making that type of content! Would you believe that I only spend an hour or less on Instagram per day? With the new Instagram activity features, I know that it is more like 53 minutes to be exact! But what is truly interesting is what I do in those 53+ minutes per day that help us to achieve growth like 800+ new Instagram followers per month. Going through hashtags that your ideal Instagram followers are posting to is a super important strategy that is often overlooked. In your best performing hashtags you are likely to find people who are looking for brands like yours, so take the time to leave genuine heartfelt comments and see where they lead you! Fun fact: I have set up post notifications for many of the influencers that we know and love who happen to also use Plann! Why? Well, as someone who is aaaall about rainbows, sunshine and friends supporting friends, I do my best to support the influencers who promote and support us by leaving them comments on their new posts. It’s a simple gesture but in the world of Instagram, it means the world! Direct messages on Instagram are a fantastic opportunity to showcase the personality and human-ness behind your brand. With the additions of GIFs, voice messages and video responses you can really jazz up your DM’s and make your audience feel super special. Taking the time to do this will help build trust and familiarity with your audience, and they’ll be way more likely to take action and support your brand in the long run. Check out our best tips for Instagram direct messages for more! If you ever decide to run an Instagram advertisement that will be displayed in the newsfeed (i.e. anything that isn’t a stories ad!) you better prepare yourself for some comments. Most of the time they are lovely questions, brand advocates tagging their friends… generally all the nice peeps on Instagram! But, there will sometimes be a commenter that has it out for your brand and you’ve got to respond quick as sticks to avoid further outrage. From me to you, keep a close eye on the comments section of your ads! Brand hashtags are super duper important, especially if you want to increase the amount of user-generated-content (UGC) that you have up your sleeve ready to be re-posted! I commit at least 10 minutes a day to going through our hashtag #plannthat to find content from our lovely Plann’rs. It also helps to ‘follow’ your brand hashtag so that you get the top performing posts directly in your newsfeed. As an Instagram-friendly brand we get tagged in Instagram posts a whole lot! That is why it is *super* important for us to jump in and leave lovely comments for the people who take the time to shout us out. If you are encouraging your audience to tag you in posts, make sure you reciprocate by responding quickly and expressing your thanks! As I write this blog we currently have one active Instagram advertisement running. It’s been a winner for months now and it consistently drives downloads for our Instagram scheduling app and as an added bonus, we gain followers after people spot our ad! While we aren’t actively seeking to gain followers with our Instagram ads, it is a nice byproduct of using the service so if you are yet to dip your toe in the water of advertising i’d definitely recommend you give it a try. There you have it, legend! We’ve opened up the book to our Instagram strategy and I really hope it has helped you to learn a thing or two. Feel free to share this article around with anyone who is a bit stuck on what to post, how often to post and who is generally curious as to how we grow our Instagram account at Plann! While I am sure that our strategy will change over time, this is a great framework for anyone to get started with a new Instagram content plan.